Established in 1970, our law firm holds the distinction of being the longest standing legal services provider in the area. Through our long history of community involvement, we have established long-standing relationships with our clients. Serving private individuals and businesses as well as the Polk County government, we are proud of our record of success. All of our attorneys have extensive experience with their respective areas of the law, and each has the skills and resources necessary to achieve the results our clients expect and deserve. By providing a personalized and dedicated approach, we can obtain the best possible outcome that is in each client's best interests. Personal injury victims and their families can rely on our firm to secure maximum compensation while holding the responsible parties accountable for their actions. Employees injured on the job can retain our services to ensure they receive their rightful benefits. Those needing a defense against criminal charges can count on us for aggressive representation, and we can assist those who need counsel involving a civil litigation suit. Additionally, our family law division has helped numerous families through the emotionally challenging and complex issues surrounding domestic relations matters. 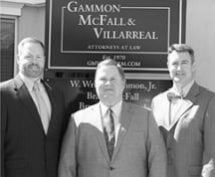 Anyone with a legal need in one of our practice areas can contact the Gammon, McFall & Villarreal law firm for a free initial consultation.